“Everything is practice,” said Pele one of the greatest footballers of all time. Life is a practice. Parenting is a practice. Even loving is a practice. Everything is practice, it truly is. When we practice something, we are taking action to get better at it. We do something over and over again to master it while continuously learning and adjusting course along the way. Practice doesn’t make perfect however, it simply makes progress. So why is it that we don’t practice our Purpose and bring it to our daily work? Why is it that we have ignored this potentiality? And whose responsibility is this? Is it yours, your managers or your leaders? I believe it’s up to you because Purpose is intrinsic. It requires you to self-lead not look to others to provide it. You don’t need your appointed leaders to permit or mandate Purpose because trickle-down Purpose like trickle-down economics simply doesn’t work. You need three things to start practicing your Purpose now and bringing it to your daily work. The first is the courage to admit you are ‘off Purpose’, the second is the willingness to go on a Purpose adventure and the third is to make the time for it. If you think you’re too busy to make time for it, just look at the past week. How many of those hours were spent inside and outside of work in unhelpful or time-wasting activities diverting you away from your Purpose (you know TV, social media, pointless meetings)? What if you were to devote those hours to practising your Purpose instead? What would that feel like to you? What if every worker in the world became a practitioner of Purpose? Wouldn’t that be something? 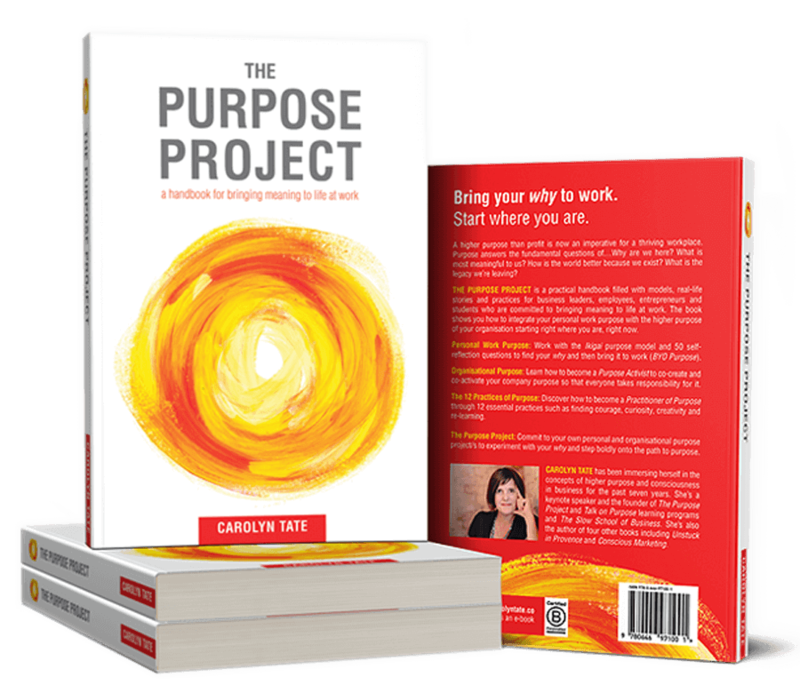 Buy 10+ books direct from Carolyn here and receive a bonus copy of The Purpose Project e-journal. Subscribe for a sample of The Purpose Project and receive regular updates. If you’re ready to lead a Purpose movement in your workplace, buy The Purpose Project Kick-Starter Package. Receive 100 books + a one-hour workshop with Carolyn @ $2,990! The Purpose Project Leadership Program Here Now! Discover how to create an awesome business with a new approach to marketing driven by PURPOSE and PEOPLE.